What I am going to do is copy and paste each week into MSWord and substitute Sarah’s name and info with my name and info. I will do this same concept for each consecutive week. Then each week I can mail a page to my grandchildren and at the end of 1 year they will have a history of their grandmother and have their current information in it too!. 52 Weeks of Genealogy – Week 1 – How Did You Get Your Name? 52 weeks of Genealogy. Join the fun!! Week 1: How did you get your name? What does your name mean? I was named after my beautiful great grandmother, Thelma Sarah Lewis. 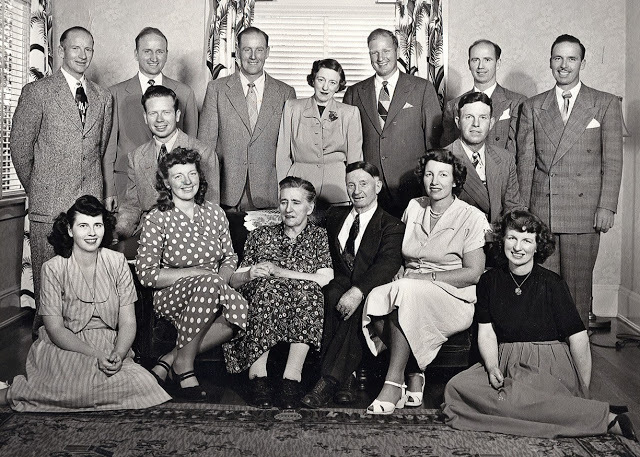 Here’s a family photo of her parents and 12 siblings; she was the 5th of 15 children. She’s on the bottom right in the photograph. Now it’s your turn. How did you get your name? What does your name mean? Keep it short and simple and it becomes easy. Exciting news on writing your family story!